Montpelier has a healthy arts scene, with venues including the T.W. 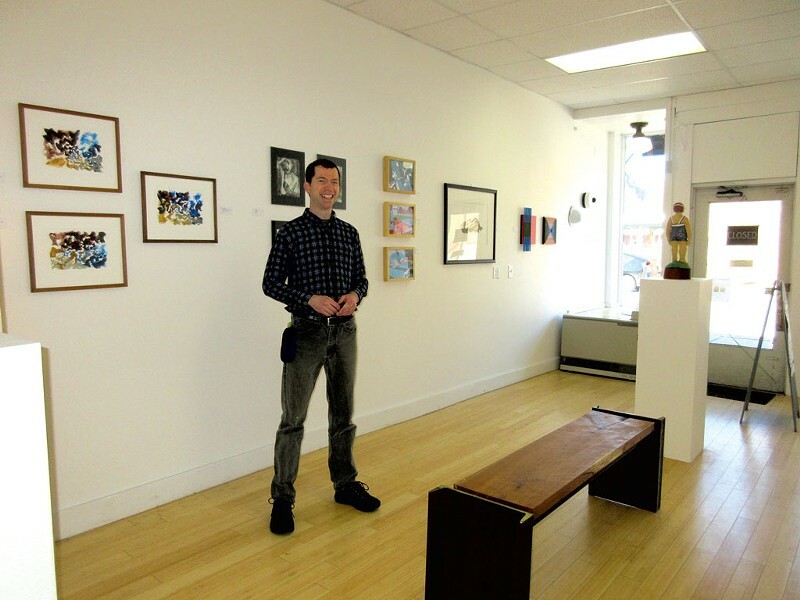 Wood Gallery and the Spotlight Gallery at the Vermont Arts Council. But it currently has just one commercial fine-arts gallery: the Front. That venue emerged a year ago in a small, L-shaped space just a few steps from Main Street. When the city holds its quarterly Art Walk this Friday, May 6, the Front will host a reception for a new show to celebrate its first birthday. All 16 members of the gallery will have works on display. The Front is a collective — an organizational model that artist-founder Glen Coburn Hutcheson said evolved after a couple of previous incarnations of the gallery in the space. He described that evolution while showing a reporter around during a recent visit. On view was a lively mix of abstract wood wall hangings by Chris Jeffrey, stoneware figures by Hasso Ewing, photographs transferred to tile by Maayan Kasimov, and other work. Shows at the Front change every six weeks. Hutcheson began renting the space as his personal studio three years ago, after completing a master's in sculpture in New York City. He could afford the rent for only about six months. "When I ran out of money the first time," Hutcheson said, "I brought in some people who would let me have the back space" while they ran a gallery in the front. Gallery SIX, as it was called, lasted a year and a half. When it closed, Hutcheson decided to vacate, as well. But the arts-loving community objected. "The reactions I got from people gave me the idea that, if we could get enough people together, it wouldn't be so hard financially," he said. "We got a good response." Twelve artists signed up. Members pay dues every three months and take turns staffing the place during public hours on Friday evenings and Saturdays. The gallery takes a 20 percent commission on sales. All decisions are made collectively. "That's been one of the things I've really liked about it: I'm not in charge," said Hutcheson. He recently moved his studio into his home; in its place at the Front, members are erecting another interior wall to create more art-hanging space. Even the gallery's name was chosen by consensus. "I do think [the name] is kind of funny, in that it implies there's something else going on besides art," Hutcheson said with a smile. "Which, of course, there isn't." So far, the Front has hosted life-drawing classes for the public and, for members, film screenings, critique nights, potlucks and parties. At the back of the gallery, a tray of drawing supplies is paired with a huge sheet of paper tacked to the wall and labeled "free draw." At openings, artists and members of the public can doodle on a fresh sheet. Hannah Morris, a Vermont native who moved back to the state in 2012 after years in Cape Town and New York City, joined the Front in December. She appreciates the artistic community fostered at the gallery. "It's a hub for creating. And it's beneficial for the members to see each other's work," she said by phone. Morris, a mixed-media artist who lives in Montpelier, will have figural soft sculptures in the birthday show. Janet Van Fleet, a sculptor who works primarily in found stone, wood and other materials, is a founding member of the Front. Seventeen years ago, she also helped found Studio Place Arts in Barre, a nonprofit commercial gallery with rented studios on the upper levels. Van Fleet has exhibited her work at venues around the state and beyond for two decades. "It's hard to sell art in Vermont," she said. The Front's model is "one answer." The gallery is also a gift to the community, Van Fleet suggested. "That [money for dues] is money artists are paying that they're not making. So it's a real commitment — financially, of time, of work — all to bring art to the public." That commitment doesn't seem to be curbing demand for membership. "There are literally dozens of artists who want a [dedicated] place to show," said Hutcheson. Owing to limited wall space, the Front is at membership capacity. When spots do open, the members choose new artists together. "It's a funky little place," said Morris. "I'm so curious to see what we do." The original print version of this article was headlined "Collective Effort"